An unusual feature of stomatal microanatomy in certain taxonomically-related Eucalyptus spp. The mode of stomatal development is studied in cotyledons, seedling and adult leaves of species of eucalypts and three species of Angophora. In the cotyledons of all species examined the early stomatal initials are unilabrate or dolabrate. The stomatal initials in seedling leaves of species of the Corymbosae and Clavigerae are anisocytic. In the 4th seedling leaf in species of a group we have previously called Monocalyptus the stomatal initials are also anisocytic. All other eucalypts retain the early cotyledonary mode of origin of stomata throughout life. These two modes of origin, whether anisocytic or by unilabrate and dolabrate initials, are set in all eucalypts from the 4th seedling leaf onward. Secondary characteristics of the adult stomata, e.g. number of subsidiary cells, are more complex than those of the seedling leaves; rarely, the relatively simple pattern of the seedling leaves may persist in the adult leaves of a given species. In species in which the initials in adult leaves are unilabrate or dolabrate, groups of stomata may share one or more subsidiary cells or be juxtaposed without an intervening subsidiary cell. The sister cell(s) of the guard mother cell may precociously develop a thicker cuticle than ordinary epidermal cells, and this may be apparent at maturity. The abaxial stomata of the cotyledons (but not of seedling or adult leaves) are regularly aligned parallel to the main venation. The existence of three main types of origin of stomata characteristic of three large non-interbreeding groups of eucalypts is of interest in the taxonomy of the genus. Development of the stomata of Eucalyptus orbifolia (in which they are relatively superficial) and E. incrassata (in which they are deeply sunken) is described from light microscopy of thin sections of resin-embedded material. The envelope of the guard mother cell is retained intact while in the daughter cells (guard cells) the inner and outer thickenings are formed. The mother cell envelope may even remain discrete and intact during early stages of formation of the separation spaces, precursors of the future stomatal pore, between the thickenings. Remnants of the guard mother cell wall may be retained as parts of at least the inner stomatal ledges. Likewise, remnants of the wall which divides the mother cell persist on the maturing guard cells. Sudan III-positive materials, probably cutin, are removed from the cuticle over the mother cell soon after it is formed. The cuticle above the guard cell is finally perforated by enzymic attack forming, in E. incrassata, a large cavity outside the developing stoma into which the outer stomatal ledges grow as extensions of the upper guard cell walls. The termostiole is suggested for the aperture in the cuticle. The flanges of cuticle seen in section to bound it are termedostiolar ledges. The ostiolar ledges are to be distinguished from the outer stomatal ledges, which develop from the upper thickenings of the guard cell initials. The distinction is clear in E. incrassata (and other species with deeply sunken stomata) but not in mesophytic plants or species with superficial stomata such as E. orbifolia in which the outer stomatal ledges are fused with the cuticle. Growth of the outer stomatal ledges in E. incrassata involves transport of wall materials through an annular space, the equivalent of an ectocythode. The relevance of the observations to stomatal development in other genera is discussed. Intercellular strands associated with stomata: stomatal pectic strands. Pectic strands are shown to connect the lower stomatal ledges and to develop across the posterior chamber of a number of plant species. Similar strands are formed between guard cells and subsidiary cells, and between epidermal cells. 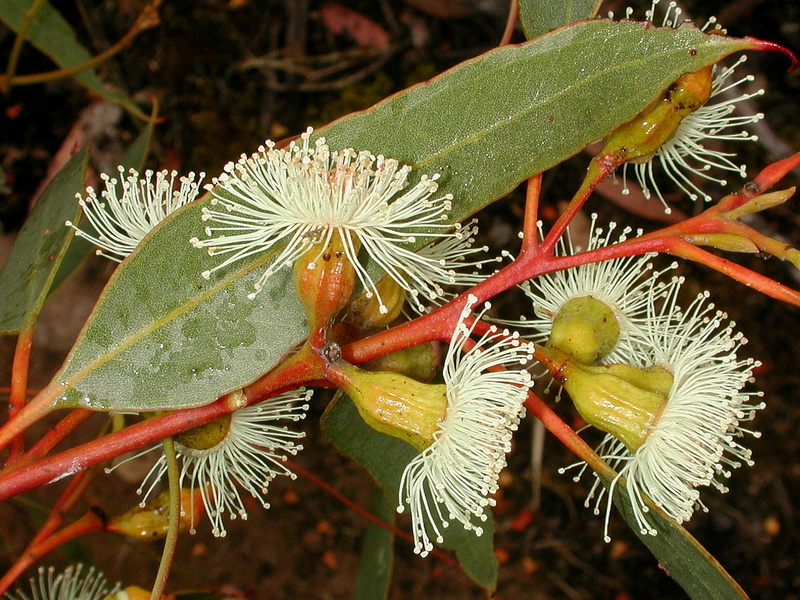 Adult leaves of the species of five groups of eucalypts, previously thought to be related on grounds of comparative morphology, especially of the flower, are shown to have stomatal complexes conforming to the type, rare among angiosperms, known as staurocytic. They develop from anisocytic complexes, typical of the seedling leaves. Adults leaves of many of the species have complexes with mostly four or five subsidiary cells. The spectrum of frequencies of subsidiary cells may be characteristic of individual species. Posted on December 19, 2016 December 19, 2016 Categories DICOTSTags Carr D. J., Carr S.G.M.Leave a comment on Staurocytic stomata in Eucalyptus.